In a galaxy far, far away, stormtroopers were once the fearsome fist of the Galactic Empire. So, it's no surprise that when the First Order rose up after the Empire was defeated, they started training stormtroopers of their own. 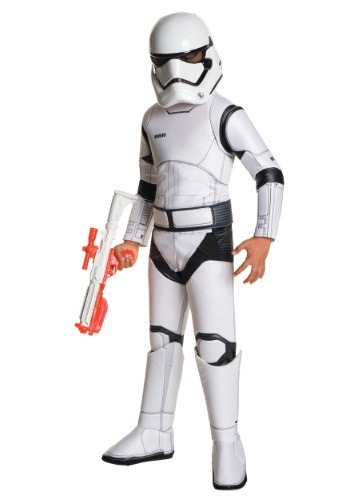 Your little soldier can suit up and fight against the Resistance, too, in this official Super Deluxe Stormtrooper Costume, from the smash hit Star Wars movie, The Force Awakens! Luckily, your little stormtrooper will look just like one of the most elite soldiers in the galaxy when they are sporting this licensed costume, so they won't have to worry about getting in trouble with any First Order commanders. The jumpsuit features detailed foam armor plates, and includes a matching molded plastic helmet and foam belt. Get them a good toy blaster to complete their fearsome look, which is a great addition to any Star Wars group costume!